1. Medium brown hardwood has a long aesthetic life. 2. Highly detailed oak and exotic woods can steal the room’s focus. 3. Red — cherry wood, red oak and chestnuts — can be difficult to work with. 4. Engineered hardwood better withstands moisture than hardwood. 5. Tiles work best in industrial design. bathrooms and hot climates. 6. The extra effort and expense of heated tile repays with joy to your feet. The 4-year-old son of a friend watched over my shoulder recently as I worked on plans and flooring for The National Home Show’s dream home. Our firm created the interior design for the home at next month’s show — I hope you get a chance to see it. I asked my young friend if he preferred the dark wood floor or tile. He immediately picked the hardwood. Apparently, tile hurts more when he falls. Not exactly a design consideration, but very practical. Making the choice combines both aesthetic and practical qualities. In our climate I often steer clients toward a medium-coloured hardwood that has some graining. Walnut is beautiful for both its colour and for its grain quality, and is naturally a medium-brown colour, with no strong red details. Remember the floor is a backdrop to the room. As colour trends come and go, you will always be able to work harmoniously with walnut. 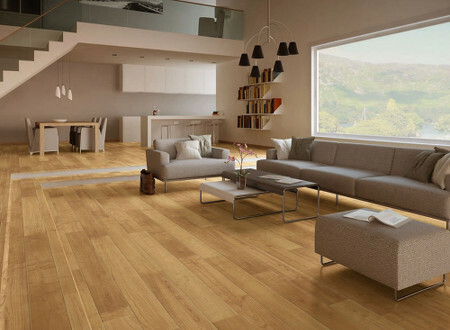 Oak was a popular choice based because of its hardness and its availability in North America. While oak is harder than walnut, it tends to have a yellow-orange colour. With a stain applied to darken the wood, the grain becomes more apparent and goes almost black. If oak flooring exists in the space, I advise keeping it and staining it. But if starting from scratch with a new build or custom home, then I recommend walnut flooring. If hardness is really the issue because of big dogs or a love of stiletto shoes, then bamboo is a better choice and is 150 times harder than oak. Exotic hardwoods have been popular and can be really beautiful. Yet they can be risky since they’re indigenous to a humid place and when it’s -25C outside, maintaining a high humidity in your home is difficult. In winter months you tend to see larger spaces between the boards that will tighten again with increased humidity in the summer. Exotic woods also have strong characteristics that can steal the room’s focus and can be difficult to work with for design updates or change. Brazilian cherry, for example, starts with a red tone and over time becomes a maroon colour with sunlight and age. If the base element of the room is maroon, your colour options are limited when selecting new furniture and accessories. Home shows can be a great place to see product up close, and there you can see how the floor works with your siding choice, window trims and even furniture. If you already have furniture you’re working with, bring a swatch of fabric or a cushion with you for a colour match. This weekend you can take advantage of the experts at the GTA home show at the International Centre — including me. Flooring questions are popular and I’ve been asked several times about the best places to use hardwood, and also the difference between engineered and three-quarter-inch hardwood. Let’s solve this now. People regularly ask if it is OK to have hardwood in the kitchen and, yes, it is perfectly OK. The surface of the board, with a factory finish, is very durable, even around liquids. The sides of the boards are not finished, so avoid having water sit on hardwood since it will make it swell. The continuous sightline of hardwood reaching into the kitchen is so visually appealing that I’m happy to advise it. Yet there are exceptions. If you have a dog then keeping the floor dry around the water bowl will be difficult. Practically, you may want to select a porcelain tile in the kitchen, or have food and water in a tiled area. Hardwood will never love you like your dog does. Next, people want to know if engineered flooring is a second-rate hardwood — buyers are concerned they aren’t getting good value for what they pay in the combination of hardwood over the plywood base. Once the floor is laid, however, the effect is the same as three-quarter-inch flooring. Engineered flooring’s base keeps the floor very stable and far less susceptible to changes in moisture. Engineered product, I believe, is superior to the “full wood” version. As well, since it’s thinner than three-quarter-inch hardwood, it matches more easily with existing floor heights. If you are in a condo, engineered really is the best choice. It can be glued to the concrete or it can be floated over the concrete slab. I advise extending the wood straight to the front door of your unit. Often there is a landing pad of tile at the front door intended for wet boots. But, generally, you will first walk through the lobby, to the elevators, and along the hall before you get to your own unit. So the continuity of wood flooring also becomes a practical consideration in a condo. Tile, on the other hand, works well in an industrial loft. Porcelain tiles can mimic concrete or stone, or provide a textural element to the floor or walls. Large format tiles give you the look of polished concrete without actually having the concrete’s weight. It is perfect, also, in warm climates. Tile is used most in homes in the main bathrooms where showers and bath tubs can create standing water. It’s especially great in our climate in heated bathroom and kitchen floors. It may seem like just another expense but I assure you, you will enjoy that heat every morning and every night of the entire winter. I often use Nuheat to make the pad, mainly because you can customize the heating mat to the shape of your room. Areas to consider heating include inside your shower. Heating the floor under the vanity or the tub isn’t necessary and the custom mat can avoid those areas. There are many other options beyond tile and wood, including carpet, vinyl, linoleum and leather. Even after you choose — hardwood, for instance — there are many options to choose from. If you need some assistance with your choices, then make your way to both the GTA Home Show this weekend and the National Home Show next month. I’d be happy to help you at either show — or both! Glen Peloso appears every two weeks in New in Homes & Condos. He is principal designer of Peloso Alexander Interiors, national design editor of Canadian Home Trends magazine and a contributor to On the Go magazine. You can catch Glen on the Marilyn Denis Show, 10 a.m. Mon-Fri on CTV. Contact him at pelosoalexander.com, follow him on Twitter at @peloso1 or @glenandjamie, and on Facebook.